October is National Physical Therapy Month. This month, we encourage you to learn and educate yourself more with the benefits of physical therapy. 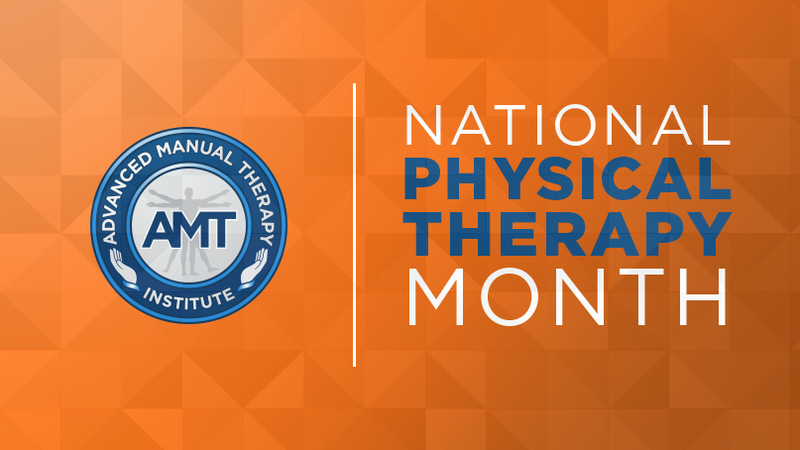 The goal of this month is to raise awareness on the key role physical therapists play on a daily basis. From helping people improve mobility and finding pain relief, physical therapists play a large role in improving a person’s overall quality of life. Physical therapy is concerned with identifying and maximizing the quality of life and movement potential within the spheres of promotion, prevention, treatment/intervention, habilitation, and rehabilitation. This encompasses physical, psychological, emotional, and social well-being. Physical therapy involves the interaction between a physical therapist (PT), patients/clients, other health professionals, families, caregivers, and communities in a process where movement potential is assessed, and goals are agreed upon, using knowledge and skills unique to physical therapists. Physical therapists are professionals that guide patients in managing their conditions to achieve long-term health benefits. They examine each patient, develop a plan and begin a treatment that helps reduce pain, restore function and prevent further disabilities and pain. Many hold a number of degrees beyond what is required. Many patients are surprised in the years of experience they hold in education. Some may further their scope in education and knowledge by attending graduate school and hold a Doctorate degree. Their wide range of knowledge benefits each patient tremendously as they never cease to find a solution for you. Each treatment is custom created based on a physical therapist’s analysis of your condition, challenges, and physical goals. The reality is that physical therapy helps you live your life pain-free. At Advanced Manual Therapy, we work collaboratively with each of our patients to determine the best path to take. We diagnose and assist you during your movement exercises. Each exercise is determined to increase your overall quality of life. After having an injury, it can be extremely difficult to get back into the groove of things. We often encounter many restrictions in our balance, movement, and mobility. Actions such as eating, walking, eating can all be affected by this. Physical Therapy allows you to ease back into the routine of things. Slowly but surely, treatments restore your mobility, improve your coordination and get your body back to adapting to pressure on certain areas of your body where you feel the most restricted. Many sports athletes find themselves seeking physical therapy help to treat their injuries to help them return to their sports lives. If you are currently living with chronic pain, then you must understand how this condition is frustrating and discomforting to our day to day activities. Physical therapy techniques help to reduce inflammation, aches, and pain while restoring your muscle’s function. Advanced Manual Therapy’s combination of physical therapy and manual therapy approaches to ensure that your pain will be treated regularly and managed weekly to keep the pain from returning to your body. When seeking physical therapy help, you can expect progress and long-term health benefits within your body. Statistics have mentioned that physical therapy is an effective treatment for a number of different conditions. It is an approach that is just as good as surgery and is able to help people with various types of chronic pain including pain in the spine, lower back, and most muscle parts of your body. Chronic pain is a condition that affects many people around you. This month, we encourage you all to ask questions and learn more about your physical therapy options and benefits. Don’t put your pain aside. With the help of a Las Vegas Physical Therapist, you are able to get proper care and guidance to help you return to a healthier quality of life. Contact Advanced Manual Therapy for more information and questions or schedule your appointment to meet with one of our passionate professionals! Next Post How Can Physical Therapy Help Me?